Information on this page is scant. Minimax is not a well documented subject on the internet, and being as I came to existence after the well after the heyday of Minimax, I’m not the most informed on the subject. Despite this, I still have compiled what I have been able to find while researching. If you have any information you’d like to share on the subject, please leave it in a comment below! Minimax was one of Houston’s older original grocery stores. Competitors at the time included Henke & Pilot, and Wiengarten. Minimax operated stores under a franchise system. As with many other early franchises they expanded by offering franchise rights to existing stores. Franchisees had a great degree of freedom, with some even keeping the original name of their business in front of Minimax. As is evident by the advertisement for Mondrik’s Minimax Below. Taken from The Cameron Herald (Cameron, Tex. ), Vol. 105, No. 42, Ed. 1 Thursday, January 7, 1965 Credit: University of North Texas Libraries, The Portal to Texas History, http://texashistory.unt.edu ; crediting Lucy Hill Patterson Memorial Library. As grocery chains go, the franchise model never really caught on. 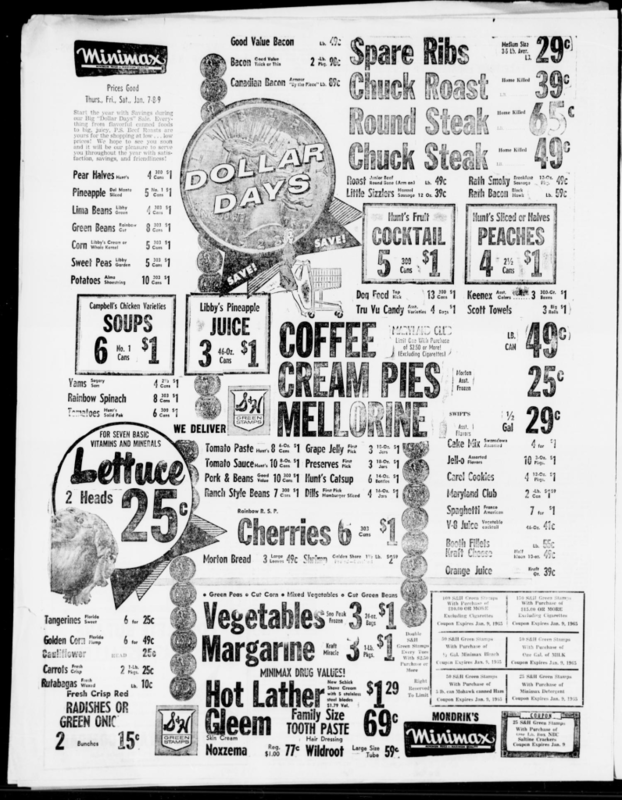 Large scale chain grocery stores began to migrate to Houston in the 1960s. Henke & Pilot was converted to Kroger, and Safeway began their first expansion. Minimax managed to survive up until the 1980s, and some locations may have made it into the 90s. However, this was at a reduced presence compared to the statewide locations the chain had previously held. Many of the buildings still stand. However, very few if any still operate as full fledged grocery stores. Mostly due to the small nature of the original Minimax locations. An Austin location from 1956. Taken From: Douglass, Neal. Crestview Minimax Food Mart, photograph, August 15, 1956; (https://texashistory.unt.edu/ark:/67531/metapth33127/: accessed April 10, 2019), University of North Texas Libraries, The Portal to Texas History, https://texashistory.unt.edu; crediting Austin History Center, Austin Public Library. As of 2018, most of Houston’s original grocery stores are remembered in some way. Weingartens continues to own and manage many of their former properties and the shopping centers they occupy. Henke & Pilot has become the name of a trendy Gastropub. While Minimax has been left to the wind. With only a single somber reminder. Minimax Drive, a road leading to the now demolished Distribution Center opposite of Northwest Mall. 2601 Cartwright Rd Missouri City, TX 77459 Hopper's Minimax Open in 1986, possibly in 1992. Previously a Gerland's now a gym. 1719 Garth Rd Baytown, TX 77520 Texas Superfoods Minimax now a furniture store.